The OBS Engine 2 is from a long standing brand who founded their business in China in 2014. OBS had great success with their original Engine RTA 25mm (dual coil) and the rest of the rebuild-able series, the Engine Mini RTA 23mm (dual coil) and Engine Nano RTA25mm (single coil). So if one wants to be pedantic, we could call the Engine 2 RTA the 4th generation of this series of RTA tanks. OBS did bring out a couple of stock coil tanks under the Engine title, the Sub 25mm and Sub Mini 23mm. My expectations are high for the Engine 2, will the flavour and build quality live up to what we have come to expect from OBS? Let put it under the spotlight and find out….. This RTA was sent to us for the purpose of this review. As always my views are my own. The OBS Engine 2 RTA comes in a box with a paper over sleeve and a draw effect box, opening the box I was hit with sheer quality, this is a beautiful looking tank, included is a box of spares. The tank is made of 304 food grade stainless steel, Pyrex glass, and a patterned Delrin mouth piece. The design and build quality of the product I would say are of the highest standard! The style of the tank is very much in keeping with the other tanks in the series. The OBS Engine 2 RTA breaks down into 4 components for easy cleaning. Looking at the build deck it is clear that this the major area of change compared to say the Engine Nano that I reviewed last year. Starting with the bottom of the base, you can see all the normal information is included; the 510 pin is press fit which means you can’t adjust the 510 pin. The base measures 25mm ballooning to 26mm where the glass sits. The build deck has 2 posts that you have to sort of hang your coils between! The positive post sits on a peek insulator. The coils are pinched by 4 stainless steel Philips head screws which to me have large heads that stick out to far taking up space inside the chamber. 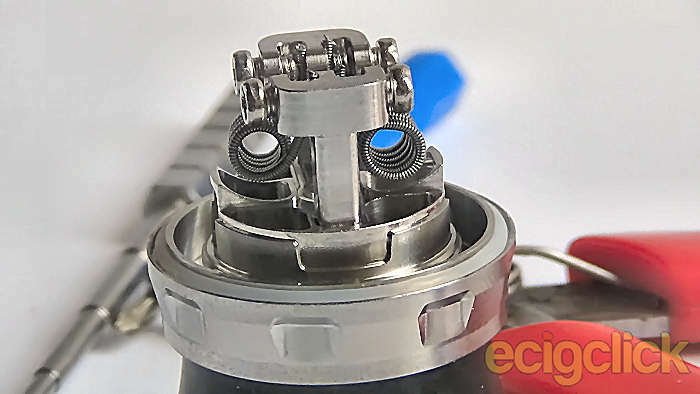 The width of build space between the posts is around 7mm (bit of a tight squeeze), the coils hang upside down over the internal airflow (AF) which has a scooped shape positioning the coils just right over this is a must, you also have 4 wicking spaces for your cotton. Made of Pyrex glass the tank will hold up to 5ml of e-liquid with a spare in the box. The assembly comes as one piece and is made of stainless steel; the chamber has the Engine logos laser etched on the outside other than that it is pretty standard. The coil cover is in two parts the space between is the AF, tabs located on the inner section; fit into cut outs located on the inside of the deck they create a seal for air to travel down the narrow space and through the internal airflow, the inside is domed so any condensation will drop back down. The visible part of the chimney is short, understandable considering the size of the deck posts and the fact that the rest of the chimney is inside the top part of the assembly. The top AF is handled by a ring that freely spins over 3 holes enabling you to precisely tune your AF to your liking. The fill port is located under the top AF, a small mark on the section shows where the port is, lift the ring to reveal it, the other side of the fill port ring has the OBS logo. To complete the assembly above the AF is the space for your 510 drip tip. Made of delrin the drip tip has a mottled pattern, it has a 14mm outer diameter with the internal bore being 7mm and the base is flared to fully cover the SS plate on the assembly. You can replace coils and cotton without fully emptying the Engine 2 RTA. Unscrew the base from the main structure. Insert your coils, clip the leads after inserting. Position your coil over the scooped internal AF, heat and strum your coils. Insert your cotton trim and tuck into the wick spaces. Dampen your coils and cotton with e-liquid. Screw back into the main structure. Fill your tank with liquid. Tip – take your time installing the coils! Until you are used to installing the coils upside down it can be of a bit fiddly job. How does the OBS Engine 2 RTA Perform? For this review I have installed 2 Alien Kanthal Clapton coils 0.18Ω, the e-liquid I will be using is ZAP! Vintage Cola, sitting on the Eleaf Invoke 220w. Starting at 25w with the airflow almost closed (Mouth To Lung Style) I experienced a cool vape with a good amount of vapour for MTL the flavour was excellent. With the AF open to half (Direct to Lung Style) I again experienced a cool vape with a decent amount of vapour the flavour was again excellent. The AF open fully this time, (DTL) the vape was warm a great amount of vapour was produced and the flavour was very good. Pushing the wattage up to 90w resulted in a very warm vape; the flavour not as good as at lower watts still good though, the vapour production was enormous. I have settled on 88w as my sweet spot with this RTA and these coils it still gives good flavour and vapour while not being quite so hot for my poor micro lungs lol. I have notice during my time in testing the OBS Engine 2 RTA that the AF does create a bit of noise while wide open, however I found the AF to be pleasant and swishy. Thinking on it, the top 3 AF holes could stand to be a little wider this might help a little with the noise. I have enjoyed the flavour from this RTA however to me it’s not a stellar flavour, dragging the Nano out I found that pull for pull the Nano had a slight edge on the flavour front, not by much but still! At 65w for 8 toots I did not receive any dry hits, the tank did get warm but cooled down fairly quickly. I will admit I have never installed coils upside down before! At first I was a bit put off by limited space for building, I found it quite difficult to hold and position the coils, but taking my time and hoping my hands didn’t cramp up (arthritis) I think I managed quite well. All threads are well turned and smooth to operate, the O rings are of excellent quality and fit the various places on the tank very well indeed. The drip tip is good looking feels very comfortable in the mouth and fit very well on the tank, it disappointed and surprised me somewhat that the tip is a 510 with the styling of the tank an 810 tip would have in my opinion been better suited. I don’t want you to think I hate this RTA far from it, I’ve enjoyed my time with it! Although I do feel that OBS seem to be stuck in the style that works, the AF while swishy with good enough flavour I feel that they could have tweaked it a bit for a bit better flavour. The posts, while hanging the coils is different, maybe they could have done something to make the posts a little more user friendly. Overall I do like the OBS Engine 2 RTA, while the building can be a bit of a pain, once you get it going like all the Engine tanks it’s a work horse, be it a very familiar work horse. Would I buy the OBS Engine 2 RTA should I lose or damage this one? I’m on the fence! Yes I like it well enough but No I wouldn’t miss it.